What do the authors of the Narnia tales, and the Lord of the Rings have in common? C.S. Lewis and J.R.R. Tolkien created powerful ‘biblical’ personalities and themes to drive their works of fiction. These men had a basic faith in the God of the bible and the purpose and plan that he would accomplish. God’s plan is a matter of public record in the scriptures. However, it has been ‘sealed’ and it’s message hidden. In vision the apostle John saw the sealed scroll that God the Father was holding. He cried when he realized no man was worthy to open the scroll and reveal its meaning. But there is someone who can open it. Do you know who is worthy? Like Aslan in the stories of Narnia, the Lion of the Tribe of Judah, is worthy to not only understand God’s plan, but to bring it to fruition. 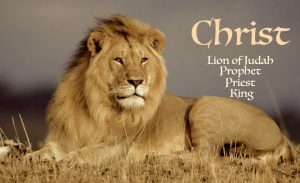 The ‘Lion’ is Jesus Christ the prophet, priest, and king who preserves all those who trust in him. Like all of God’s prophets, Christ came to speak uncomfortable truths. He had the gift of discernment and the ability to counsel and guide all those who would listen to the truth. Christ, the prophet, counsels people to repent, or like a tester of metals, the crucible of war will determine their quality. Christ as high priest bears our sins and carries us with tenderness. He alone has the power to break the power of evil through his sacrifice. Through fellowship with him, his friends are delivered, and given renewed life. The great priest/king brings peace to all by preserving the knowledge of God, the knowledge of the old ways. Crowned as King of Kings, he will usher in a new age of justice, prosperity, and healing. If you have seen or read the ‘Lord of the Rings‘ you will recognize all of these themes. Christ the King will come with all the power of heavens armies to destroy darkness, shepherd the nations, and reward his servants. The future reality is so much greater than the fantasy. Learn more about Christ, the Messiah.